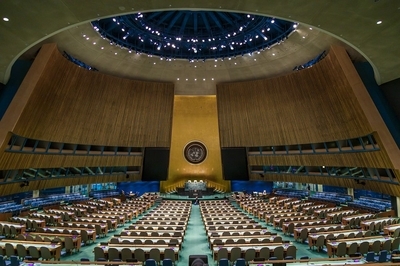 No matter the lens applied, it is hard to view the United Nations as a serious body. A look at its specialty councils and commissions reveals an Orwellian world where committee titles mean the opposite and the resolutions they pass exacerbate the problems they're supposed to address. Even modest attempts at internal reform have somehow managed to churn out results that make bad situations even worse. Nowhere is this problem more evident than in the UN Human Rights Council (UNHCR), a world body that gives hypocrisy a bad name. In blistering critiques delivered by Secretary of State Mike Pompeo and U.S. Ambassador to the UN Nikki Haley, the Trump administration announced its withdrawal from what Haley referred to as "a cesspool of political bias." A year ago she called for dramatic and needed institutional reform, but what she found instead was an innate inability to change. Remaining on the council would effectively make the United States complicit in turning a blind eye to some of the world's worst ongoing atrocities. The Geneva-based body was established in 2006 as the successor organization to the Human Rights Commission. Seeing no reason to grant the new body legitimacy, the Bush administration decided against seeking membership because some of the world's worst criminal regimes and serial abusers would be included in its rotating membership of 47 states. That changed in 2009 with the "outstretched hand" policy of the Obama administration, which included the decision to join the council and seek its salvation from within. Despite its founding mission to protect and promote human rights, it didn't take long for the bloom to fall off the rose. Since its inception, the council has promoted some of the world's worst abusers while protecting terrorist groups. This fixation prevents the passage of other important resolutions. For example, in recent months, Haley led efforts to draw attention to human rights violations in places like South Sudan, Congo, and Cambodia. What she found instead was an almost singular preoccupation with the one functioning and stable Middle East democracy: Israel. A look at the record of the world body reveals the alternative reality it inhabits. From 2006 until 2016, the UNHCR condemned Israel 68 times. By way of contrast, Syria, home to one of the bloodiest civil wars of this century, was condemned only 20 times. North Korea, which operates forced labor camps, and Iran, under a regime that brutally crushed a peaceful protest movement in 2009 and hangs citizens for the crime of homosexuality, were only condemned nine and six times respectively. The list of states and organizations never condemned during that decade-long period is equally impressive. It includes Russia, which targets hospitals and schools as a matter of course in Syria, and Turkey, which holds the current record for jailing journalists. Also left off the list is the Palestinian Authority, which runs a "pay to slay" program where it rewards Palestinian families who carry out bombings, stabbings, and other attacks against Israelis; and Islamic Jihad and Hamas, both of which continue to launch rockets and missiles at Israeli civilians from Gaza. Although the 135 resolutions the council adopted that criticized countries, more than half of them were against Israel, the Washington Post chose to run its story on Trump's recent decision under the headline, "U.S. withdraws from UN Human Rights Council over perceived bias against Israel." Perceived bias? It's not just that the council has a track record of voting a particular way; its anti-Israel program is foundational and exists as a permanent item known as Agenda Item 7, which mandates a discussion on Israel at every session under the title, "Human rights situation in Palestine and other occupied Arab territories." No other country is singled out in this manner. The bias isn't a matter of perception. It's baked in. At a time when Trump Derangement Syndrome has taken hold in many mainstream media outlets, this type of decision tends to get painted with a broad brush. For many news sites, it is presented as just the latest U.S. withdrawal from a world organization, treaty, or understanding. Yet while one can debate the efficacy of the president pulling out of the Trans-Pacific Partnership, the Paris accords on climate change, or challenging the G7 countries, those debates at least have two coherent sides with positions worth considering. In the case of the UNHRC, the argument for remaining in the council is that it is better to reform the institution from within, despite the past nine years attesting that the corruption is built in and the organization is unable to be reformed. UN Secretary General Kofi Annan finally understood this problem when he disbanded the predecessor organization, the Human Rights Commission, because of its "credibility deficit." Unfortunately, what was established in its place was no better. Ban Ki-Moon, who succeeded Annan as secretary general for two full terms, even recognized that the institutional bias against Israel extended throughout the UN as a whole. In his departing speech at the end of 2016, he explained: "Decades of political maneuverings have created a disproportionate volume of resolutions, reports and conferences criticizing Israel. In many cases, rather than helping the Palestinian cause, this reality has hampered the ability of the UN to fulfill its role effectively." What he alluded to there is key. After all, those at the world body who single out Israel for condemnation tend to defend themselves by donning a cloak of support for the Palestinian national cause. But there's far more to it than that. Hillel Neuer, executive director of UN Watch, provided a few examples from 2016 alone of how it works across several UN agencies. In October, the UN Educational, Scientific and Cultural Organization (UNESCO) "negated its mandate to protect world heritage by adopting a resolution which used Islamic-only terms for Jerusalem's Temple Mount, the holiest site in Judaism, denying thousands of years of Jewish and Christian heritage, religion and culture." Meanwhile, the UN women's rights commission condemned Israel as the world's only violator of women's rights, which ignored real abusers of women's rights such as Iran, Qatar, Pakistan, and many others. A November 30, 2016 UN resolution even called on Israel to transfer control of the Golan Heights to Syria. That is to say the world body requested that Israel hand over vital strategic territory to a regime that was gassing its own people amid a civil war in which hundreds of thousands of civilians were being slaughtered. When an organization invents abuses against women in the only Middle Eastern country in which they are in practice fully equal under the law and asks it to take actions to shrink its size and put its civilian population at risk, that's not pro-Palestinian, it's just anti-Israel. When added to it is the denial of the existence of any Jewish connection to the religion's holiest sites, and a denial of the Holocaust, it isn't merely anti-Zionist. It's simply anti-Semitic. Of course, it is easy to conclude that the problem with the clown car isn't the car; it's the clowns riding in it. Sure enough, the current clowns on the UNHRC don't bode well for the protection of human rights. They include Qatar, Congo, Venezuela, China, Cuba, Iraq, Pakistan, Afghanistan, and Burundi. If that isn't mind-bending enough, the UN's forum for disarmament, which produced the treaty banning chemical weapons, is currently headed by none other than Syria. So it is possible to blame both the clowns and the cars that enable their behavior. The constant funnel cloud of garbage that committees like the Human Rights Council produce may not resonate with Americans who quite rightfully could care less about UN pronouncements. But its resolutions lay important groundwork meant to undermine the United States, its allies, and the freedoms upon which this country was founded. Withdrawing from the council and defunding its activities makes the point that the United States will not be held hostage by the lowest common denominator at the UN. If nothing else, it is one aspect of President Trump's "America First" ideology most Americans should be able to fully stand behind.